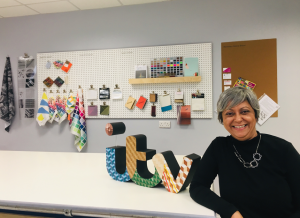 We are delighted to share the news that STEAMhouse member, Bharti Parmar, has been commissioned to take over ITV’s logo for one week, starting today, for the channel’s new on-screen identity project called ITV Creates. Launched on January 1st 2019, every week new idents are showcased, with a different interpretation of ITV’s logo created by a wide range of British artists from Turner Prize winners to emerging talent. For ITV Creates, Bharti has conceptualised the ITV ident as a 3-D sculpture that exploits common principles and designs in marquetry such as bookmatching, parquet and herringbone. Designed in similar colourways to the existing logo, her interpretation cleverly subverts the scheme using decorative motifs. 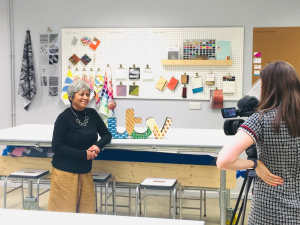 Bharti will be on ITV Central News this week, with the interview aired either Tues 18th or Wed 19th ITV Central News 6pm talking about this project. The initial design work for this project took place at STEAMhouse with the assistance of Digital Technician Paul Found, with the fabrication of letters and construction of the sculpture in Bharti’s studio in Birmingham. Bharti has been working at STEAMhouse for 6 months on a project about illusion and surfaces, with a particular interest in wood, veneers and the craft of marquetry. Bharti’s art practice of over 25 years encompasses printmaking, sculpture and painting. She trained at the Royal College of Art and has a PhD in material culture studies. She has been artist in residence on prestigious gallery programmes, most recently at the Irish Museum of Modern Art Dublin, her work features in several institutional collections and she continues to support the work of artists through her role as trustee for various contemporary art commissioning organisations in the region. 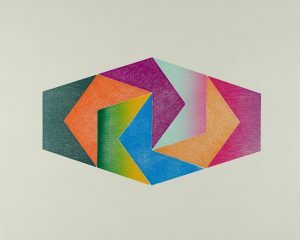 Bharti is also showing her major new project, Tesserae, a limited edition portfolio of woodblock prints about pattern, shape and geometry. 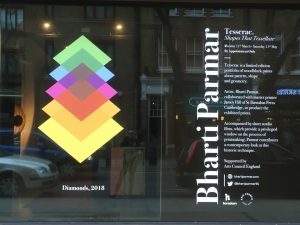 Bharti collaborated with master printer James Hill of St Barnabas Press Cambridge to make this suite of prints and a series of short studio films, which provide a privileged window on the process of printmaking. To discover more of Bharti’s work, check out her website.